Have you been told that you need total shoulder surgery? Chances are, you’ve been living with chronic shoulder pain for some time now that you weren’t able to relieve with conservative treatment. Tahoe Fracture & Orthopedic Medical Clinic, a full-service practice, is pleased to offer total shoulder surgery to patients in this area. We have offices close to Minden, located in Gardnerville and Carson City. What is Total Shoulder Surgery? The shoulder is a ball-and-socket joint where the head of the humerus (the “ball”) rotates within the glenoid cavity of the scapula (the “socket”). During total shoulder surgery, the surgeon replaces both the ball and the socket with prosthetics. This is different than partial shoulder surgery, where only the ball is replaced, and the socket remains in place. 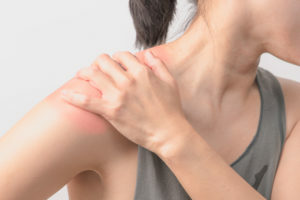 There’s also a third type of shoulder replacement surgery referred to as “reverse shoulder surgery,” usually reserved for patients with a severe rotator cuff tear, where the surgeon essentially switches the placement of the ball and socket within the shoulder joint. If it turns out that you’re a candidate for total shoulder surgery, you can rely on the expertise offered by a full-service practice like Tahoe Fracture & Orthopedic Medical Clinic. Our multi-disciplined team includes orthopedic surgeons with the specific training needed to treat your condition. Plus, we have physical and occupational therapists, physician assistants, and nurse practitioners onsite who can help guide you through the treatment and rehabilitation process. Having all of these experts in one practice allows us to provide you with seamless care and eliminates the need for you to visit multiple providers at various locations. If you’re in the Minden, NV, area and you think you might be a candidate for total shoulder surgery, please contact Tahoe Fracture & Orthopedic Medical Clinic today. We’ll be happy to provide you with additional information, answer your questions, and help you schedule an appointment at one of our conveniently located offices. We look forward to helping you restore your function, mobility, and quality of life.